With polls indicating that Colombia is increasingly likely to approve a peace deal with the FARC, the possibility of a landslide defeat is causing cracks in the conservative opposition. According to a poll released by pollster Datexco on Friday, 70.5% of polled voters said they approve of the peace deal they will vote on in an October 2 referendum. In early August, when Datexco began polling voter intention, this was only 42%. But since then, Colombians have seen a constant stream of progress in the peace process and have been amply “educated” by the national government. Many governors and mayors have expressed their support for a “Yes” vote and are using their governments to promote the deal. Victims and minority organizations are almost unanimously urging to support the deal. Mainstream media have also begun highlighting the possible benefits of peace and the international community is almost unanimously keen on seeing Colombia’s armed conflict disappear. All this much to the distress of the opposition to the deal that has been reduced to the Democratic Center (CD) party of former President Alvaro Uribe and dissident members of the Conservative Party (CP). The CD is the only political party promoting a “No” vote, but with the absence of apparent success the party is beginning to show cracks. 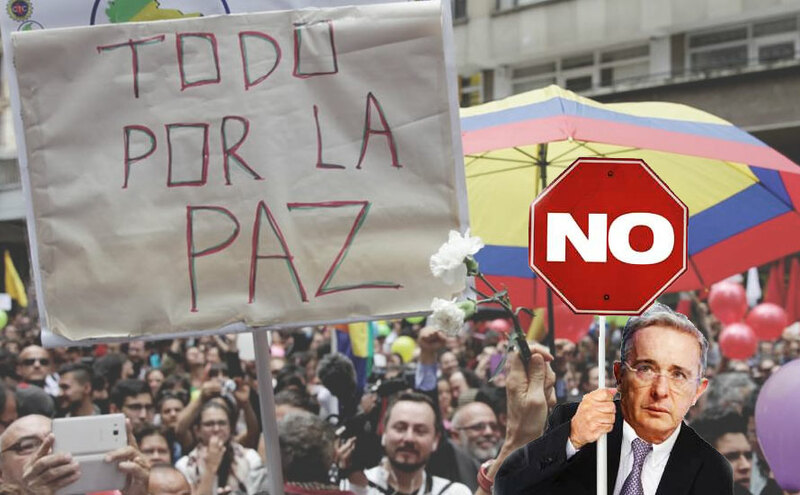 From within Uribe’s party, the current “No” campaign is challenged either by some who support abstention and others who have deflected to the “Yes” camp. A major blow for the party was the news that the Democratic Center mayor of San Vicente del Caguan in Caqueta urged citizens of his city to vote “Yes” in the referendum, breaking entirely with the party line. San Vicente del Caguan lies in the heart of FARC territory and was host to failed peace talks between 1999 and 2002. It is currently hosting the FARC’s 10th Conference in which the guerrilla group is expected to dissolve itself. House Representative Samuel Hoyos then proposed to forget about the “No” vote and promote abstention like the campaign had done before in the hope a low turnout would make the vote invalid. But the most illustrative of the former president’s dwindling support was a CD-organized protest at a peace event on Thursday in Medellin, Uribe’s hometown, that was attended by no more than 30 people. In Pereira on Friday, Uribe was booed away by supporters of peace with the FARC. But Uribe is not the only one facing a party under major pressure. The coalition Conservative Party is split between the party leadership and former President Andres Pastrana and Marta Lucia Ramirez, Uribe’s first defense minister. Both were in office when war crimes related to the conflict, many of them committed by state-loyal paramilitary groups and the military, peaked. When Pastrana was president, paramilitary massacres peaked and when Ramirez took office, the extrajudicial execution of civilians to report them as dead guerrillas suddenly became a common phenomenon. Ramirez announced her resignation from the party’s board of directors on Thursday in protest of the party’s support of the peace deal. Pastrana withdrew his support of the peace talks in October 2015 when the negotiators announced the transitional justice deal. There is broad resistance in Colombia to the transitional justice element of the deal, which most controversially grants a convicted war criminal the — albeit unlikely — possibility to stay out of prison and, through the political participation agreement, enter politics. But this element also has major legal and political implications for Uribe, Ramirez and Pastrana. The justice deal could uncover state crimes that have been in impunity for decades, including the ones that were committed under their watch. This transitional justice system could call to trial the 24,400 state officials who, according to the prosecution, are either convicted or on trial for war-related crimes. Colombia’s current impunity stands at an 98% in cases of war crimes, according to victim representatives. The judicial benefits offered to convicted former state officials who tell the truth are high. A lot of former lower officials could incriminate a lot of former top officials in an attempt to be pardoned or see their sentences lowered. The Truth Commission could even call presidents to clarify war crimes that, in cases systematically, happened under their watch. A number of these proven and alleged state crimes took place when Pastrana and Uribe were in office. Uribe could be called to the Truth Commission over the thousands of extrajudicial executions of civilians that occurred during his two terms in office. Pastrana will have to explain how it was possible that thousands of heavily-armed paramilitary forces were able to make major territorial gains, often with the help of the military of which he was commander-in-chief at the time. And the former presidents are not the only one with pending legal trouble, a number of senior members of the Democratic Center party, including senators, are linked to war-related crimes that could end their political career or even land them in prison.